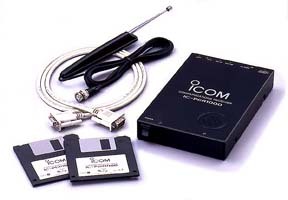 The Icom IC-PCR1000-02 wideband computer receiver connects externally to your PC. This provides compatibility with many computer models, even laptops. Incredible coverage is yours with reception from 10 kHz to 1300 MHz (less cellular). Modes of reception (and bandwidth) include AM (15/6 kHz), FM-Wide (230 kHz), FM-Narrow (15/6 kHz), SSB (2.8 kHz) and CW (2.8 kHz). A triple conversion circuit ensures good performance over the entire range. Shortwave sensitivity (1.8-28 MHz) is an impressive 0.28µV. The IC-PCR1000 lets you choose from three interface screens: Communications Receiver Screen, Component Receiver Screen or Radio Screen. Click here to view to view screens. Other refinements include: Unlimited Memories, IF Shift, NB, AFC, Voice Scan Control, CTCSS decode, six scan types and on-line help. A powerful Band Scope function allows you to visually check signals within a specified frequency range. The span range may be selected as: ± 25 kHz, ± 50 kHz, ± 100 kHz or ± 200 kHz. A built-in speaker is provided. Jacks include: BNC antenna, mini stereo audio out, DB-9F RS-232C and mini Packet. Click here to view rear panel. The sophisticated UT-106 Digital Signal Processing module is an extremely effective option. System requirements: PC with 486x4, Pentium 100 or higher CPU, Windows 3.1 or Windows 95 (not Windows 98), 16 Mb RAM, 3.5" FD, 10 Mb HD space and VGA or SVGA display. The IC-PCR1000 does come with an AC adapter, but can also be powered from 12 VDC at 0.7 Amps (with optional OPC-131 DC power cable). Only 5"x7.9"x1.2" 2 lbs. 3 oz. Click here for specifications. 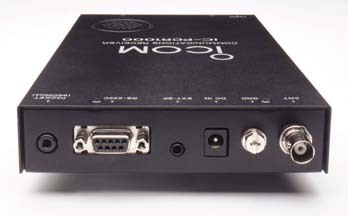 The IC-PCR1000 was reviewed in the July 1998 issue of QST magazine. 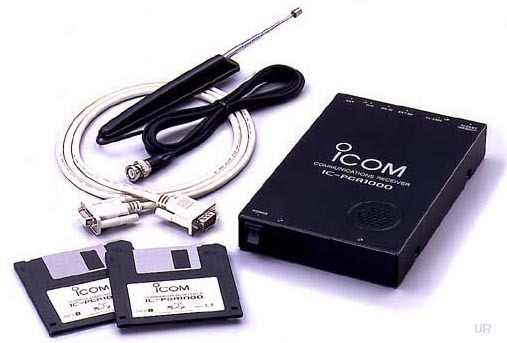 The PCR1000-07 model is the same as above, but without the 824-849 / 869-894 MHz cellular gap and could be purchased via government or qualifying communications provider purchase order or for export only. This unblocked version is not available for online ordering.